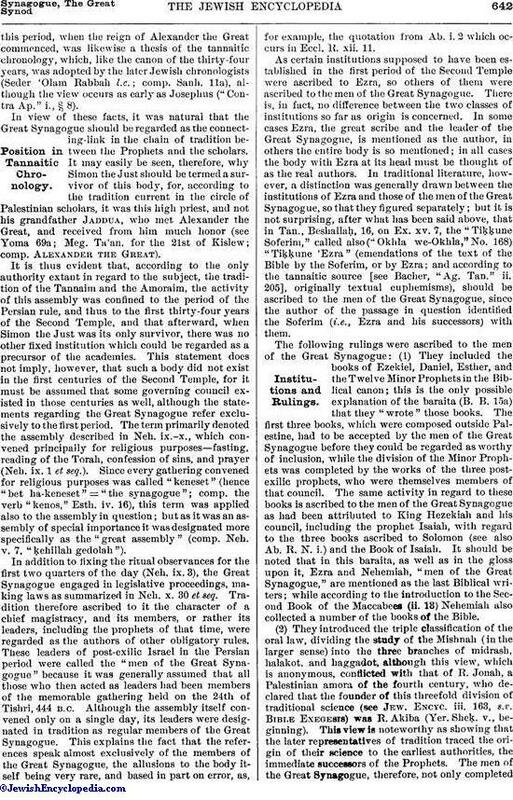 These divergent statements may easily be reconciled (see Krochmal, "Moreh Nebuke ha-Zeman," p. 97) by reading, in the one passage, "beside them" ( ) instead of "among them" ( ); and in the other passage, "thirty" instead of "eighty." The number eighty-five is taken from Neh. x. 2-29; but the origin of the entire number (120) is not known. It was undoubtedly assumed that the company of those mentioned in Neh. x. was increased to one hundred and twenty by the prophets who took part in the sealing of the covenant, this view, which is confirmed by Neh. vi. 7, 14, being based on the hypothesis that other prophets besides Haggai, Zechariah, and Malachi were then preaching in Israel. These passages indicate that this assembly was believed to be the one described in Neh. ix.-x., and other statements regarding it prove that the Amoraim accepted this identification as a matter of course. According to Abba b. Kahana, the well-known haggadist of the latter half of the third century (Shem-Ṭob on Ps. 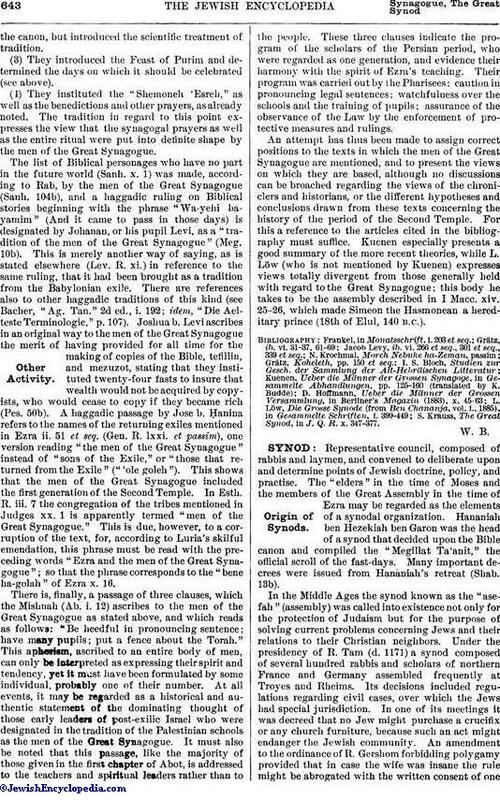 xxxvi., end), "Two generations used the 'Shem ha-Meforesh,' the men of the Great Synagogue and the generation of the 'shemad'" (the persecution of Hadrian and the Bar Kokba war). This reference is explained in a statement by Giddel, a pupil of Rab (Yer. Meg. 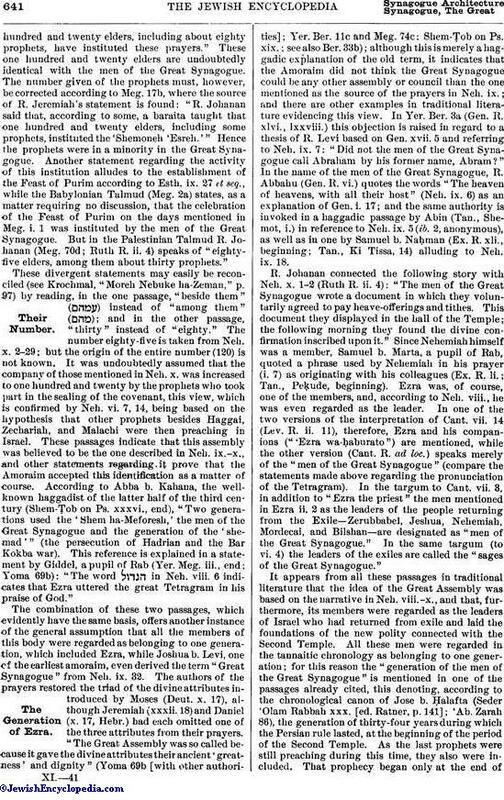 iii., end; Yoma 69b): "The word in Neh. viii. 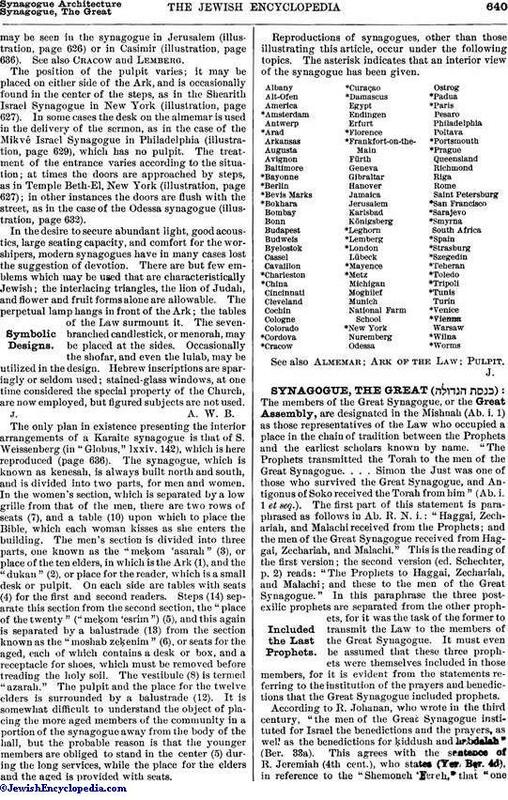 6 indicates that Ezra uttered the great Tetragram in his praise of God."